Hi dolls :) I have been quite lazy on outfit posts. I've actually shot a few looks a while back but never got around to edit them. (So if you see the snow, that explains :P) I found outfit posts to be the most time-consuming posts but, no complaints, here's a new one for you! I really like how orange looks on me. Not trying to be vain or anything, but I think orange really brightens my complexion and makes me look 10 times more awake. Who doesn't want to look like she just had 10 hours of beauty sleep? I thrifted this orange top from Goodwill and it has to be one of my favorite finds from there. The material is so soft and the "V" neckline is really quite flattering. The basic design has so much versatility and I just adore it! I know floral jeans have been quite popular for a while and the trend might be dying a bit. But who cares? I really like this pair of floral jeans from Garage. Unlike some other floral jeans I see which are quite light-colored, this dark pair is more figure-friendly. I found light jeans tend to make your legs appear bigger than they are so dark is the way to go! Last but not least, those amazing wedges are from Forever 21. Can you believe it? I snatched them right away when I saw them. They were on sale for around $28! What a steal. To play around with the orange hue, I wore Revlon Lipbutter in Tutti Frutti and Revlon Colorburst lip gloss in sizzle. Hope you enjoyed my outfit post and take care! hehe thanks <3 I really love floral pants! 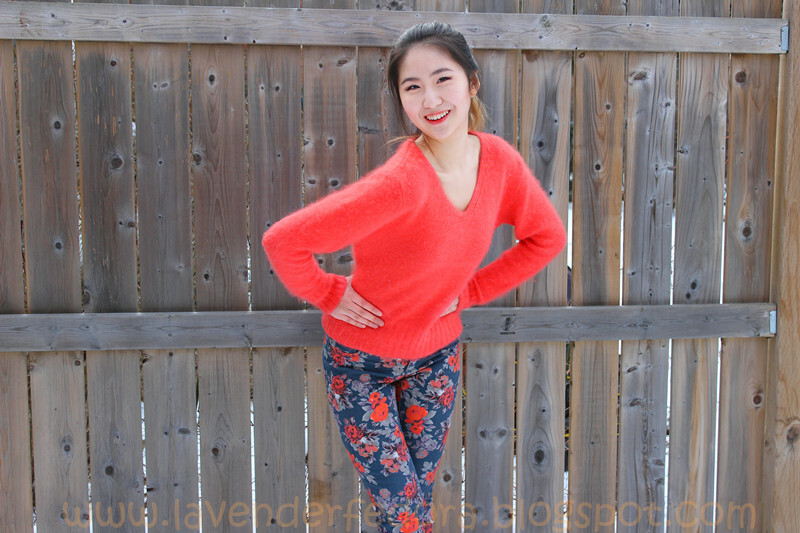 Cute floral jeans and orange sweater! Thank you so much for visiting my blog! I'm following you now on GFC:)! Gorgeous outfit. Those printed pants are amazing. You look so incredibly cute! I LOVE your pants! ADORABLE! I love the floral pants!! Thank you! They're quite something aren't they?! Love love love this outfit. The orange really does look great on you and the pants are amazing. Definitely wanna see more OOTD. Did you ever find a prom dress? I understand! I can't wait to hear about it though!! I remember my prom. So exciting and fun. I hope you have a great time. I'm your newest GFC follower! happy weekend! So adorable! I love your blog(: Newest follower right here! orange does look great on you and i like your photos. really want to try out the floral pant trend, too. I am also loving the snow, it looks so magical!